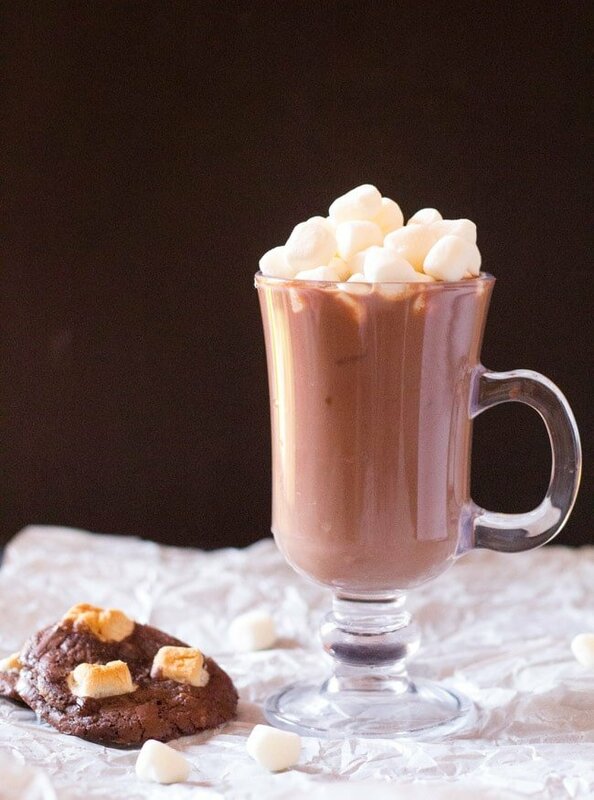 This Brownie Mix Hot Chocolate is a brownie lover’s dream come true in liquid form! 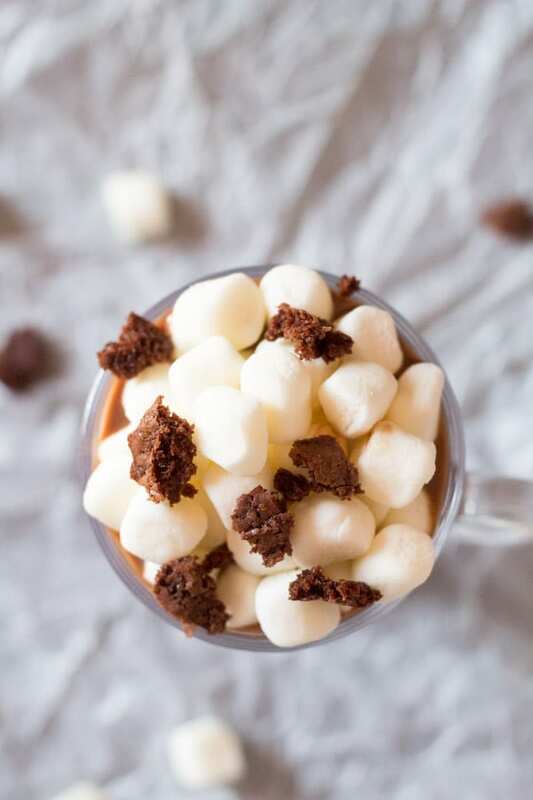 This Brownie Mix Hot Chocolate is ridiculously easy to make and is the perfect beverage to have on a chilly winter evening. So this is the very last hot chocolate recipe for I Knead to Eat’s Hot Chocolate Extravaganza. Can I just say how fun it’s been? I hope you loved it as much as I did! 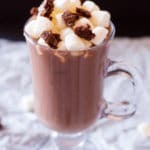 This Brownie Mix Hot Chocolate is actually an old post, and I’m updating it so that it can be a part of this extravaganza. It was originally published in 2016! WHAT IS THE I KNEAD TO EAT’S HOT CHOCOLATE EXTRAVAGANZA? 1.) So take a saucepan, add your milk, chocolate (yes, real chocolate goes into this hot chocolate), and brownie mix (I used Betty Crocker, but you can use your favorite brownie mix). Stir everything together on medium low heat until the chocolate melts and the mixture becomes smooth and creamy. Do not let come to a boil…we just want to warm the milk and melt the chocolate gently…so a gentle simmer is what we are looking for. 2.) Make a cornstarch and milk slurry, pour that slowly into the saucepan and continuously stir until the hot chocolate has thickened up to your liking. Don’t worry if you accidentally thicken it up too much, just add 1-2 tablespoons milk to thin out the consistency. 3.) This step is optional but not really optional because who can skip mini marshmallows and bits of crumbled up brownie pieces? Not me for sure! 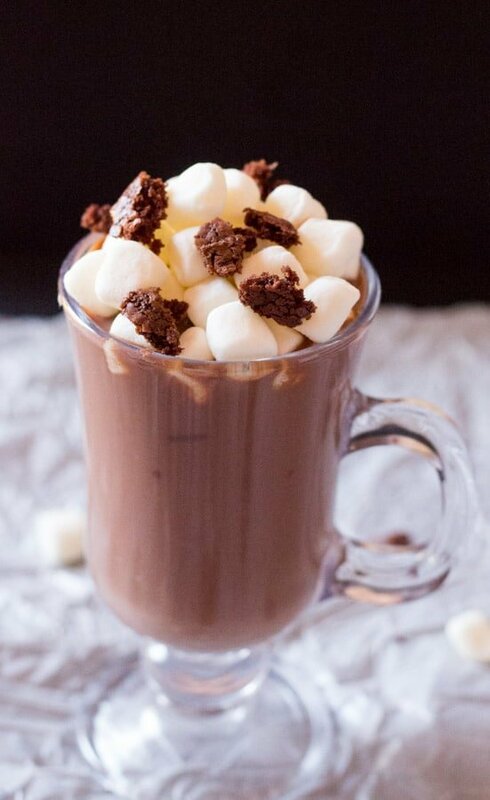 So pour the hot chocolate into your favorite mug, and add some mini marshmallows, brownie pieces and even chocolate chips if you want…! Here’s to cozy winter evenings, wearing your favorite fuzzy socks and ugly sweaters and drinking up this divine hot chocolate! In a medium sized saucepan, gently heat together the milk, chocolate and brownie mix until the chocolate has melted completed and all the ingredients are fully combined. Make a cornflour slurry by combining the 2 tablespoons of milk with the cornstarch. Slowly pour this slurry into the saucepan while continuously whisking. When the hot chocolate has thickened to desired consistency, take off heat and pour into mugs. Top with marshmallows and brownie bits if desired.